This story is too dope (pun intended) not to share with you! There’s a Twitter user named @Tahkion who is a computer science blogger that posted a series of tweets about facial recognition technology. While a pretty solid way to identify people, there is apparently a flaw in the system. Tahkion discovered that face paint such as those worn by Juggalos completely throws some forms of facial recognition algorithms all out of wack! There have actually been several articles and posts about this find, and even Elon Musk commented on it! We’ve got what I consider the best of the articles, along with Elon Musk’s response below! Check it out! Last September, the world welcomed Juggalos (or Juggalettes, depending on which you prefer) to The Resistance when they marched on Washington en masses to protest the policies of the Trump administration. As if they weren’t already doing the absolute most, the die-hard fans of the rap group Insane Clown Posse have become accidental heroes for people concerned about facial recognition tech: According to Twitter user @tahkion, a computer science blogger for WonderHowTo, Juggalo makeup outmatches the machine learning algorithms that govern facial recognition technology. You might be thinking: “Well, if Juggalos constantly wear this makeup, wouldn’t the facial recognition technology just continually recognize their Juggalo faces?” According to @tahkion, thatdepends onthe Juggalo consistently wearing the same style of makeup. This problem also assumes that Juggalos wear their makeup all the time—which they don’t. The style is reserved for Insane Clown Posse shows and other special occasions, like the March on Washington. Face-painting styles like “corpse” makeupalso obscure the face. However, they don’t create enough contrast to effectively confuse most facial recognition systems. Dramatic styles of feminine makeup,like heavy eyeliner, also are generally not enough to confuse facial recognition systems, @tahkion claims. However, facial recognition tech such as Apple’s Face ID,which does not rely on visible light and uses depth perception, would not be tricked by juggalo makeup (otherwise it would never work in the dark). People are constantly trying to come up with ways to work around facial recognition technology using everything fromrigged hats(if you’re out in public) toheavy pixelation(if you’re online). Groupssuch as CVDazzlehave tried to bring art into the effort to defeat facial recognition with art, using dramatic, futuristic styles of makeup—but @tahkion claimed CV Dazzledoesn’t alwaysobscure the face as well as Juggalo makeup. Facial recognition is already in broad use by law enforcement. This past week, the FBI used facial recognition to identify the man who opened fire on the offices of Maryland newspaperCapital Gazette, killingfive people. But use of facial recognition islargely unregulated. Amazon’s “Rekognition” toolhas been pilotedin the Orlando, FL and Washington County, OR police departments, and the company is looking to expand its use. Private companies like Moscow-based NtechLabhave developed “ethnicity recognition” toolswith the intention for it to be used by law enforcement to, in essence, automate racial profiling. This isn’t just happening in the U.S.: in China, facial recognition is used tomonitor citizen activityas a part of its extensive“social credit” system, which affects people’s ability to get loans and use certain public services, like bike rentals. To be very clear,The Outlineis not endorsing the creation of a Juggalo-makeup powered society that strives to avoid the utilization of facial data at all costs, even as we come to terms with theimplicit biasembedded in the technology. But… Juggalos… Welcome (Back) to The Resistance. 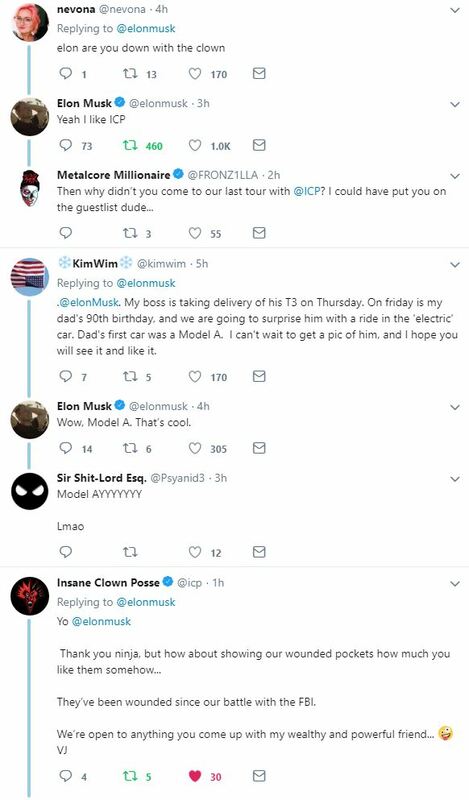 Whether Elon responds or not, I still think it’s pretty fresh that he took the time to show some love for the Wicked Clowns! Whoop Whoop Mr. Musk!